Connections for Women: One Tuna Noodle casserole too many - The Pot Luck Rides Again! One Tuna Noodle casserole too many - The Pot Luck Rides Again! I'm wearing my benevolent dictator hat this week - in other words, I'm being bossy about Easter dinner. I have family and friends who love to cook but, no offense guys, they lack discipline! We often gather here or at other houses for weekend brunches and dinners and generally everyone pitches in - and that's where excess comes into play. My daughter, a superb all round cook but brilliant dessert maker cannot stop at one thing. "Sweetie, why don't you do dessert" usually results in a variety of delicate tarts, scrumptious cakes and oh, for good measure, in case we're short she just happens to bring along a tray of appetizers as well. This family will never run out of food at a gathering. My kitchen here is relatively small and does not lend itself to multiple cooks hence the dictatorship. I colluded with a friend of my generation to come up with a menu and promptly sent that forth with checks against those items already assigned with the memo, "select a dish to bring and get back to me ASAP". It might just work. I know we won't have 5 Tuna Noodle casseroles but I do know that at least two people on the list will stray beyond their chosen dish and bring extra; I also know that it will be out of love for both the people gathering and cooking. 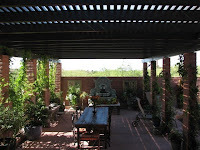 The plan is to get together around 5 p.m. and eat in the sala fresca - the outdoor dining room. Yes, poor east coasters and mid westerners, here in Tucson we can do that at this time of year - can't do it mid summer so it all evens out. And that reminds me as a child, growing up in North Africa, we kids used to sit under the shade of a palm tree and ask the deep, philosophical question, "would you rather be too hot or too cold?" Pot Lucks were a staple of the seventies entertaining and I see no reason not to let the practice become chic all over again. It's an easy on the host and economical way of entertaining, especially for larger groups. My preference (bossy again) is to let the host determine the menu and be responsible for the main entrée , then it's just a matter of farming out the accompanying dishes. I see no shame either in requesting that guests bring along a bottle of wine. Gatherings of friends and family are renewing; they invite real connection; they build family. I remember the days when I would resolutely refuse help with dinner parties and spend days preparing sauces (I was a big Julia Child fan) and sweating over elaborate dishes - even the sorbet had to be home made! Wow! those days are long gone. I had a lovely dinner with friends last weekend where only the scallops lightly sautéed in a delicate curry paste were made on site. The accompanying sweet potato fries came frozen from Trader Joes and the tiny peas served with fresh mint also came from the freezer. Easy on the cook and plenty of time for conversation. They also allow for last minute additions - in the past 20 minutes one son called to say "can we set a place for ..... she has no family here in town" and another guest made a similar request - with a Pot Luck you can say yes without angst. I love it. Dessert (s) ...daughter opted for this so I know there will be more than one! There we go - a complete do ahead menu for about 10 . Wishing you and all Connections for Women readers, a lovely holiday weekend. Visit us on AllTop too.